After a trip to Vegas with my girfriends over the weekend - more on that in the next post - I feel like I'm permanently behind on sleep, but am slowly catching up. 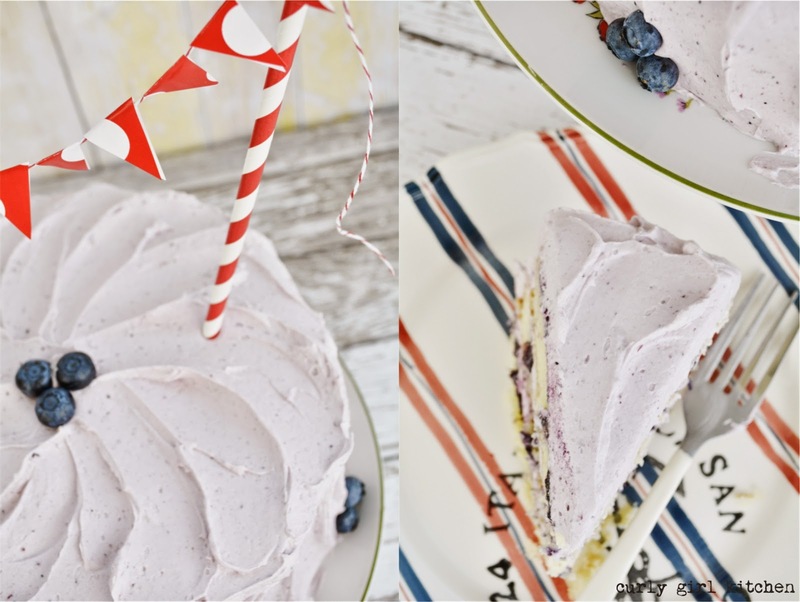 In spite of being so tired last night, though, I wanted to make something festive for the holiday, so I whipped up a blueberries and cream cake for the 4th of July. Blueberries are at their peak right now, evidenced by the great big container I was able to buy for only four dollars. I may turn the rest into a pie for Jamie, or just eat them plain with cream or yogurt, but first, I wanted to make cake. 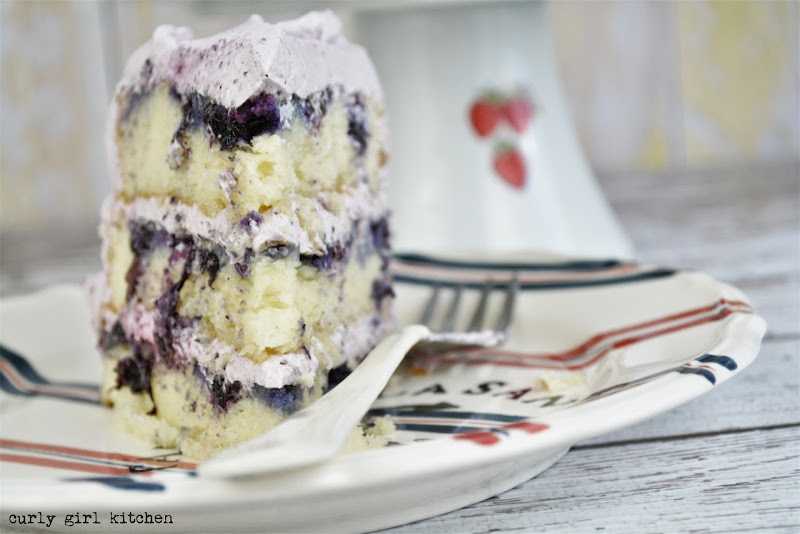 The cake is so moist, studded with plump blueberries and lusciously rich with heavy cream and sour cream, yet somehow it's not heavy at all. 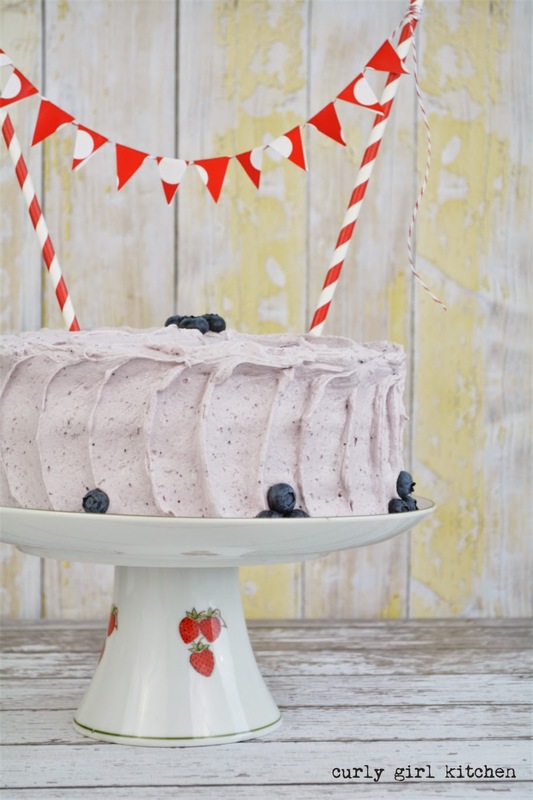 The buttercream is a pretty purple, naturally tinted by blueberry jam. 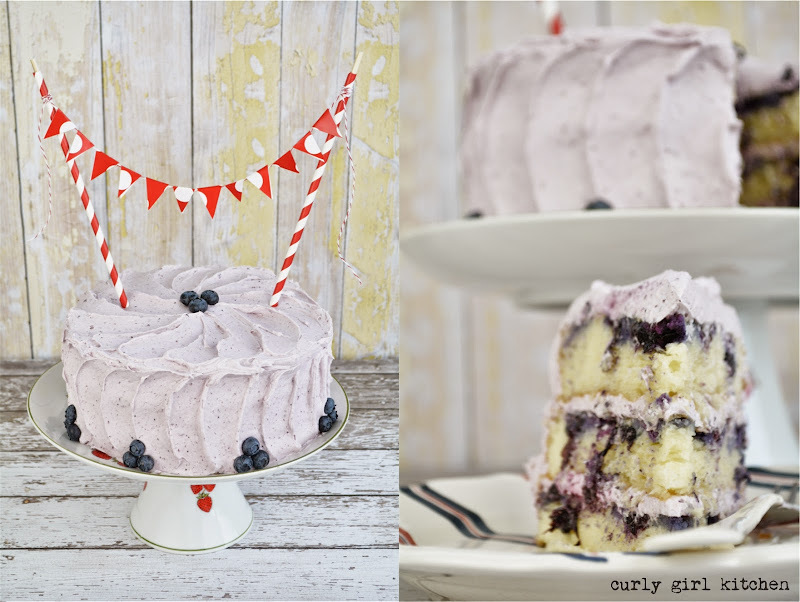 The decorating is simple, with no piping, just pretty swirls from my spatula and a few trios of blueberries. I always love celebrating holidays with cake, but secretly, I was just longing for an excuse to use my new strawberry cake stand. Preheat the oven to 350. Spray three 8-inch pans with non-stick spray. 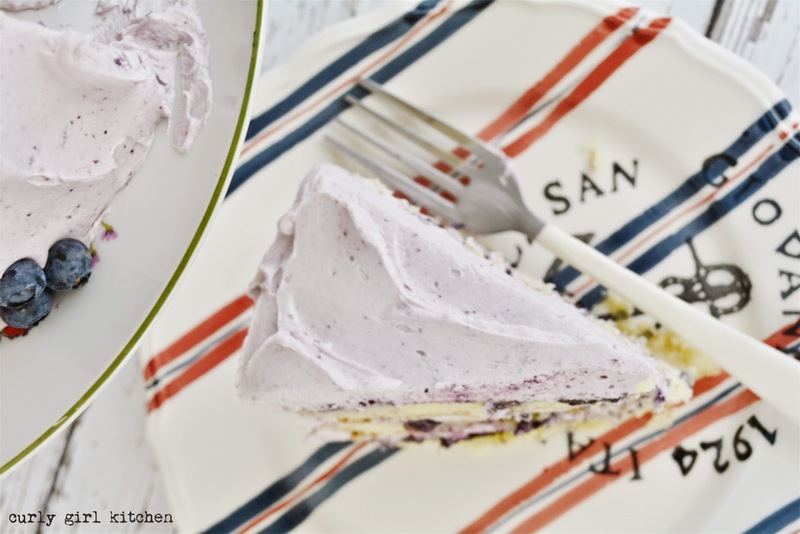 This cake is very moist, and parchment paper circles on the bottom of each pan are recommended for easier removal. 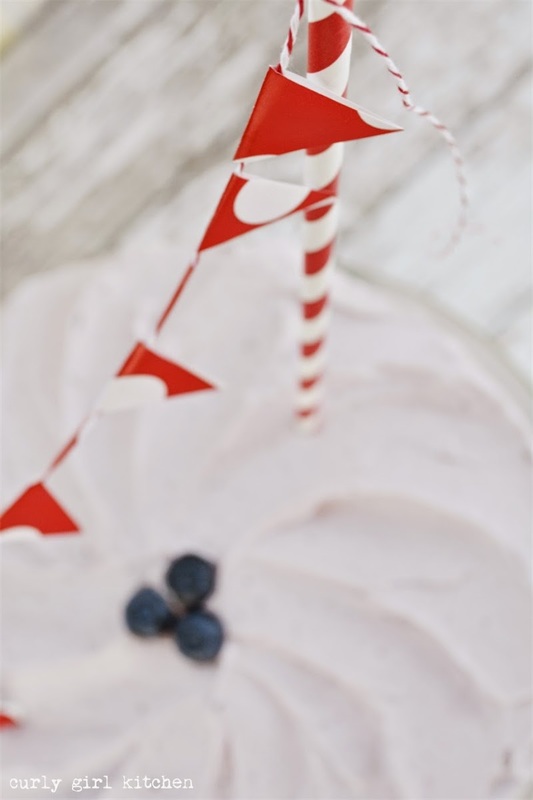 In the bowl of your stand mixer fitted with the paddle attachment, combine the cake mix, nutmeg, eggs, whipping cream, sour cream, oil and vanilla, and beat for several minutes until smooth. Fold in the blueberries and divide batter between the pans. Bake for 22-25 minutes, until a toothpick comes out clean. Cool completely in the pans on a wire rack, covered loosely with clean kitchen towels. 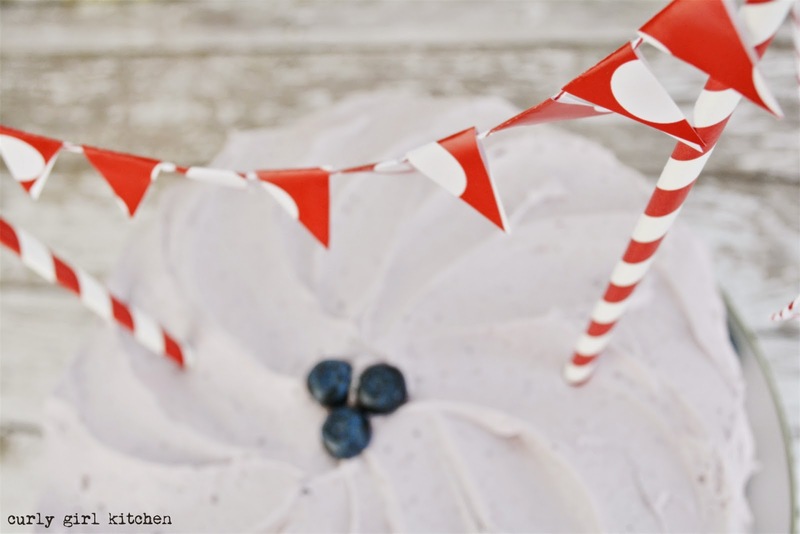 For the buttercream, fit your stand mixer with the whisk attachment. Beat the jam and butter for several minutes until smooth. Add the meringue powder and powdered sugar by spoonfuls, mixing on low to combine. Add the vanilla and cream, then whip the buttercream on medium high for 4-5 minutes until very light and fluffy. 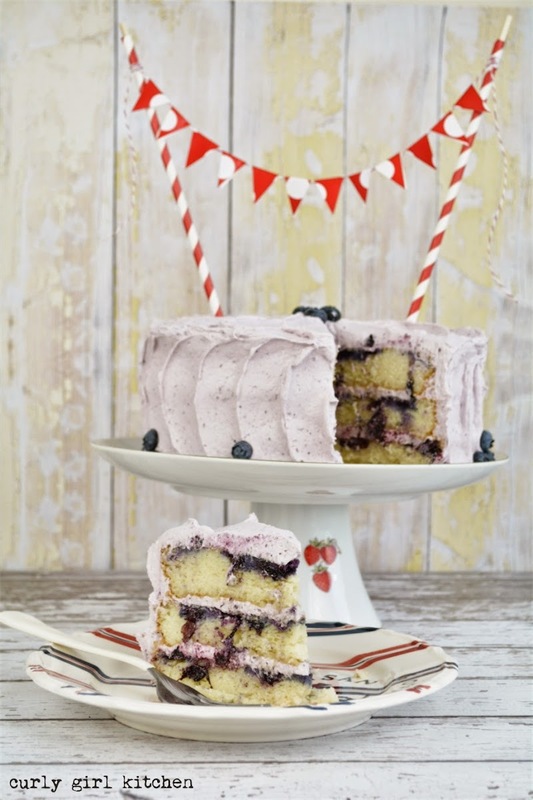 Fill the cakes, frost with a thin crumb coat of buttercream, then frost all over and garnish with blueberries.